Part of coming to terms with modern society v. Simplicity is making the best use of available tools. Fortunately, I have this amazing boyfriend who is a hard-core computer nerd and who is keenly interested in monitoring and automation. Toward the goal of a house that might eventually become SkyNet, the ever-engineery Mike Neir has set up Cacti in our house – in a nutshell, it’s a program that will monitor and graph pretty much anything you like and display it very nicely. Mike’s used Cacti in conjunction with sensors obtained from Hobby Boards to graph a lot of conditions in our house, and even wrote a script to control the heat lamps in the chicken house. 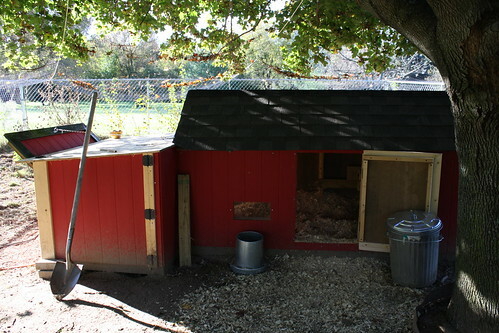 The chicken house is a modest affair – in fact, we just re-skinned the existing doghouse and made a few important modifications to save time, energy, work and expense. And when I say “we,” I mean Mike Neir. He worked very hard on the project and did a fantastic job. I was obsessing over the garden and various other projects, and did relatively little on the construction parts. A lot of information can be stuffed into these graphs. Here’s the one for the weekly chicken coop status. The background color indicates whether the heat lamps are active – red for on, white for off. Mike’s script turns the lamps on when the chicken house temperature drops below 45 degrees F, and turns it off when the chicken house temperature reaches 55 degrees F. We experimented with different temperatures and triggers, but I think this one works well. In addition to the activation and deactivation temperature lines, the graph also shows the outside temperature (gray line,) the chicken house temperature (black line,) and the freezing point (light blue line.) This week, as you can see, the single-digit temperatures have been really hard for the little heat lamps to keep up with. One thing I need to seriously consider, and soon, is adding some insulation to the house. The cold this week has left the poor girls shivering, and I’ve even had to resort to closing them up inside the house for the last two days. This does not make for happy chickens, but at least they won’t get frost bite. Inside our house, we have temperature sensors on all three levels of the house, as well as one in the HVAC duct at the furnace. Mike’s mulling over a way to script HVAC control to save more energy and money. Since installing a programmable thermostat, we have saved a few hundred dollars this winter already. Our propane consumption dropped so substantially, the gas company called and asked if we had installed a wood-burning stove of some sort recently. Nice! As with the chicken house, the red indicates when the furnace is active, and monitors the temperature in the duct at the furnace. When we’re not home, as long as the temperature doesn’t drop below the activation temperature, the furnace does not come on. The thermostat keeps things chilly while we’re at work, and heats it up during times when we are home and awake, before cooling everything down while we’re warm and cozy under the blankets. It’s really interesting to have all of this information logged and graphed, right at our fingertips in real time. Barometric pressure, humidity, minimum and maximum temperatures – all with a few mouse clicks. There are graphs for hourly, daily, weekly, monthly and yearly measurements. Quite the temperature extremes between the minimum outside temperatures of 11.86 and 93.41. The yearly graph takes averages over a one- or two-day time period, and does not draw from the absolute minimums/maximums – for instance, the minimum last night was a scant 7.25’F. Brr! It’ll be a bit slow, as it’s being passed back and forth a bit, but you can get an idea of how it looks on the back end. Click on Host: Environment Sensors, then on any graph to view the full breakdown. While a part of me silently rails against technology and the complexity it brings into our lives, I have to admit – this is pretty stinking cool. Who knows – maybe next year, Mike can wire up something that’ll detect moisture levels in the garden and automatically turn on sprinklers! He’s also working on a system that will detect whether the garage door is open after a certain hour (ie, bedtime,) that will close it – we both occasionally forgot to close the door, leaving it as an open invitation for after-dark shenanigans. Should our house eventually become self-aware, we will need to reconsider our priorities. In the meantime, however, I’ll just enjoy the fruits of Mike Neir’s labor, and keep plotting how we can further reduce our ecological footprint. I loved this bring together of the two. Would Mike consider letting us see the program and diagrams of the electronics so others might enjoy the fruits of his inventiveness? Hi Mike – Glad you’re interested in the subject! Mike Neir may be making a guest appearance on the blog soon to talk more about the subject. 🙂 One way or the other, we’ll be happy to point you toward more information. Stay tuned!